Once again, I must admit I have done very little toward my ROW80 goals this week. I didn’t manage to even make check-in at all until today. Wow–it’s been crazy! But my novella it out for sale and garnering good reviews, so that’s good. I’ve edited 3 chapters of my friend’s novel. I’ve edited nothing on my own. I doubt I will get much more done on either this week, as I’m writing blog posts for my blog tour. 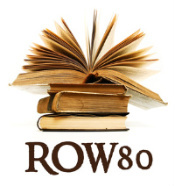 Click here for other ROW80 updates! Malakh – An Angelic Novella – Available on Smashwords, Amazon, & Amazon UK.